One of the things I miss about living on Vancouver Island is a great little raw food restaurant in Qualicum Beach that we would visit every once in awhile. Being vegan, we are not used to having a wide selection of foods in restaurants and subsequently we generally avoid eating out. A raw food restaurant is like winning the chow lottery for us. So much selection! Plus we can usually find kale chips to take home for later, the most oddly yummy snack food ever. Lately I've been craving raw food meals such as we had on the island but there is nothing close by even vaguely similar. Trying to prepare raw meals at home, I admit, I'm pretty overwhelmed. Raw snacks, of course, we do all the time. It's called an apple and a handful of almonds or a smoothie. But to do the soaked, sprouted, dehydrated and stacked, it's truly a whole new way of preparing food. Like relearning what I thought I sorted out more than twenty years ago, what with the stove business and not boiling things over. Plus, oddly enough, I just don't have the appliances to make most of the recipes in a raw food recipe book and I can't seem to bring myself to neither spend money nor fathom where I will put a gianormous dehydrator in our tiny home. Still, I have been dabbling. My great love and crutch is bread. While I adore my sandwiches and toast, I am aware that I am eating way too much of it and, frankly, my tummy isn't happy about it either. Substituting something raw for my bread snacks without feeling let down by a lack of soft, yummy accessible carbs is my great challenge. My inital attempts with rice cakes and lettuce leaves wraps left me empty but fortunately, by turning my attention towards raw foods, I've found something as good or even better. 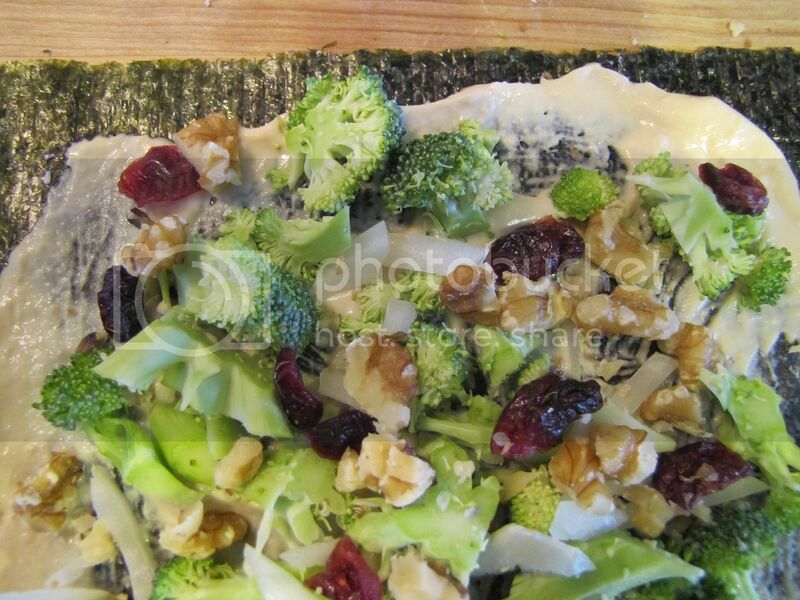 One of the easiest ways to get a raw snack fix that isn't trail mix or a salad, is to wrap stuff up in a nori roll. We make veggie maki often but it was a bit of a revelation that I could use nori sheets to hold together just about anything I like. Often the result isn't very attractive and my rolls look are lumpy and misshapen without the rice filler. They'd get almost any sushi chief-in-training fired on the spot. But they taste pretty fine and we eat them rather than spend time looking at them. For anyone else looking for a filling snack, the trick I've found to a satifying nori roll is to use a fibrous vegetable, something sweet, a savory spreadable, a bit of sharp and protein (this is my version of the five flavours). 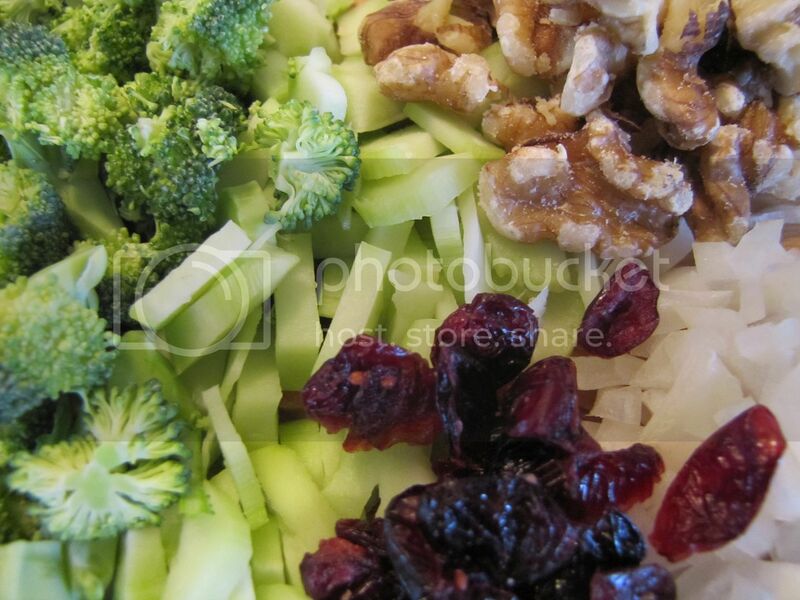 My favorite combination to date is broccoli, walnuts, onion, dried cranberry and hummus. I'm curious to hear from anyone who has been eating raw foods and how you've untangled the strange and wonderous world of raw food prep. My busy mama brain just can't comprehend any big changes, but to make small ones that only require a sharp knife and may be a blend is right where I'm at. One of the most memorable dishes I have tried was a beet salad. It used thick shredded (grated?) raw beets, and it was SO tasty! I'm sure you could add it to other recipes. We've been working on diet changes lately. This is a great suggestion! Thanks. By the way, I love your blog, been reading for a couple years, just rarely comment since I usually read from my phone. I'm also unschooling my kids, and I love your perspective on things! Keep it up! Fabulous idea! I am so inspired to look deeper into veggies for some more deliciousness. Would it be possible to use "riced" jicama, squash or some other veggie in your rollups? Sounds good even to the Omnivore! Do you ever make it up to Edmonton? There's a new raw restaurant called Noorish on 109th. I'm a keenly-cooking-omnivore but this post gave me real pause! We have a lot of nori-based foods here and i have eaten probably a ton of (failed - i have no dehydrator and have to go for a cool oven for hours on end!) kale chips since first tasting them in Uni a decade ago! Anyway, i was going to say, i have grated cauliflower for "rice" before, i don't know if you'd fancy that? But nori roll with caulirice, grated beetroot, very ripe (mashed up usually) avocado and some apple pieces (again, a soft variety, finely grated) dipped in soy sauce (fairly sure that's not raw? maybe you can sub?) is yummy and even my picky kids will have a go. The "rice" is firm and fragrant, the beets are sweet and tart, the avocado holds it together, the apple brings mushy sweetness and the soy is salty-good. Thank you for this post! I am on a very limited diet because I am breastfeeding and it turns out the baby has many food allergies. So far it seems he is allergic to wheat and soy, and I am missing wheat big time! I think I will try out your idea with the nori rolls.